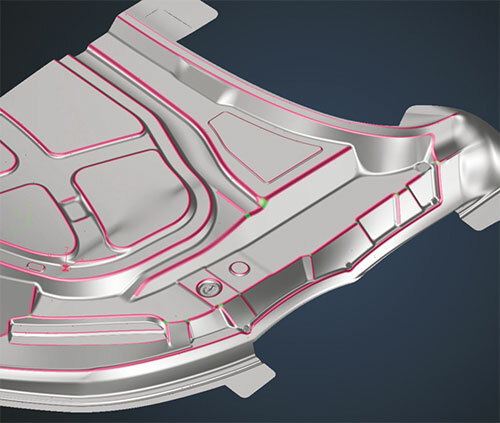 Tebis America, Troy, MI, has announced the release of its Version 4.0 Release 3 software for tool, die and mold design. Highlights of the new launch include toolbars and menu panels that can easily be docked to the edge of the application window; software interface that allows a user to learn to operate it more quickly and easily and with less effort; and a new project dialog with the most recently used files that is displayed immediately after the program is started. With Version 4.0 Release 3, Tebis also has improved the display of wire-frame models and isolines. The user often is confronted with the problem of many isolines, which can make the view of the components unclear on the screen. Further, Tebis has focused on a more efficient use of time by automatically breaking up assemblies and complex files into multiple individual files. Release 3 also provides improved algorithms that generate perfect transitions for four-edge surfaces. The user can more efficiently and quickly adjust the approximation tolerance as well as control generated radius runouts and theoretical edges. Lastly, users can shorten cycle times by roughly 30 percent in laser-cutting and -trimming applications, because the improved NC point distribution results in more compact programs. The user can set axial tolerances and manually remove NC points. Cutting-head tilt directions on the machines also can be handled more easily in stamping areas. This prevents rapid pivot movements of the machine.